"Never before have a few inches mattered so much." The tagline for an upcoming exhibit at the Bata Shoe Museum in Toronto says everything about guys in heels. Today, of course, high-heeled shoes are synonymous with femininity. Men who want to add a bit of height have to do so with inserts on the DL, and any non-cowboys wandering around with heels visibly higher than normal might get a few judgy looks. But for about 130 years in the 17th and 18th centuries, Western men wore heeled shoes as an expression of power. Italian, Ferradini, 1972-1975. Worn by Elton John. Celebrities strutted on stage in outrageous outfits and high glittering heels such as this pair, but more conservative men also paired higher heeled shoes with their suits. It makes sense if you consider the value placed on height. Tall people, particularly men, are associated with confidence and prestige -- we actually tend to pay them higher salaries. So one of the questions Elizabeth Semmelhack, curator of the Bata Shoe Museum in Toronto, poses through the exhibit is not why men wore heels at one point, but why they ever stopped. "We're so nervous about the idea of men in heels today," Semmelhack told The Huffington Post. "Hopefully, what this exhibition will do is highlight for people that what's really curious about the history of men in heels is our current attitude towards it." Semmelhack theorizes that heeled shoes were borrowed from Asia, where they were used for horseback riding, in the early 1600s. Persia had been gaining political influence around that time, and exoticism in dress was a symbol of high status. It wasn't long before women began wearing heels, too. Semmelhack explained it was (somewhat unsurprisingly) trendy for women to borrow from mens' closets in the 1600s, and there they found high-heeled shoes. Never before in the history of mankind did everyone's butts look so fantastic. The heels themselves became gendered, with slender heels for women and blocky ones for men. Then around the middle of the 18th century, men started to abandon them. But there have been exceptions. John Lennon wore boots with heels, followed by plenty of glam rockers. "Elevator shoes" (with height-boosting insoles) provided a discreet option. And somehow the cowboy boot -- which is definitely a high heeled shoe for guys -- has stuck around as a symbol of rugged masculinity. As we reconsider notions of gender and its role in society, the heel is a prime example of how arbitrary definitions of gender can be. Feel free to imagine Ron Swanson in any of the shoes below. If you find yourself in Toronto, the exhibition, titled "Standing Tall: The Curious History of Men in Heels," runs from May 8, 2015, until May 2016. English, c. 1690-1710. This sturdy boot from the turn of the 18th century features a high stacked leather heel. English, c. 1690-1715. This pair of men’s mules features high flared heels in keeping with turn of the 18th century fashion. The red leather covering the high heels was meant to bring attention to them and also a conveyed a sense of continental sophistication as red heels were famously worn in the court of French King XIV. American, Justin Boots, 20th century. The packer boot, like the more iconic pull-on cowboy boot, originated on the frontier and was worn for horseback riding. Evolving from 19th century lace-up boots, packers allowed wearers to customize the fit of the boot. The addition of the low-slung heel enabled the boot to stay stable in the stirrup. American, Tony Lama, late 20th century. The cowboy emerged in the West after the Civil War pushing cattle to railheads in the 1860s to 1880s. Canadian, designed and made by Master John, 1973. 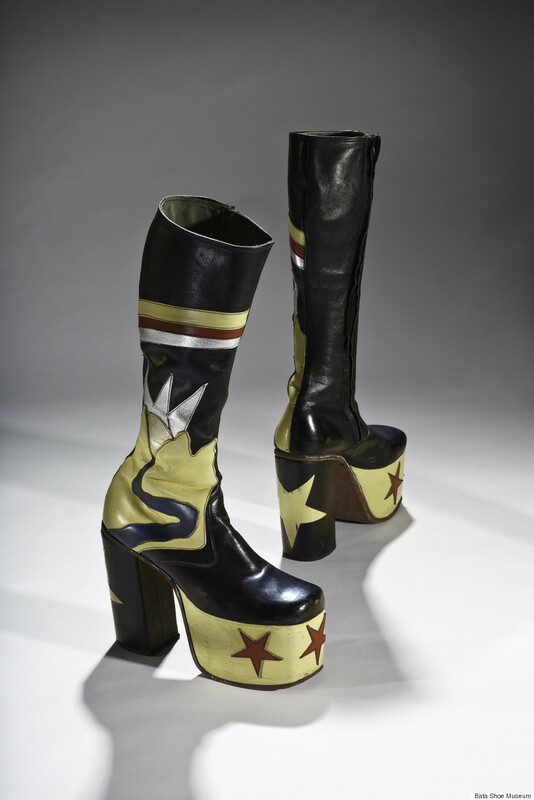 The Toronto shoemaker Master John made these men’s platform boots complete with a five and a half inch high heels, appliquéd stars and veritable landscape in leather. All photos by Ron Wood / Bata Shoe Museum.